What are the top landmarks in Oban? You can spend an afternoon studying the exhibits at Oban Distillery during your travels in Oban. While you're in the area, stroll along the seaside. Enjoy a stop at Connel Bridge, a landmark worth seeing in Benderloch. Savour the top-notch restaurants and lively bars while in town. See the views across Oban Bay to the Atlantic Islands from the platform of Oban’s most unusual landmark. Spend a few hours wading, strolling or building sandcastles at this lovely Blue Flag beach. Trace the rich and colorful history of this ruined 13th-century fortress, the site of heroic battles, royal residences and political imprisonments. Get a close-up look at more than 30 water-based species at this wonderful aquarium and rehabilitation facility. 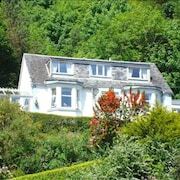 What a lovely B and B set above the town of Oban but easy walking distance to the shops and Harbour etc. Stayed in a suite over looking the bay of Oban, room was lovely, very clean and a great location for all Oban facilities. Oban is fabulous place for a short break , people are very helpful , pubs and restaurants are tops ! 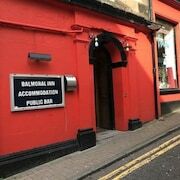 The hotel is well located for access to nearby Glencoe, as well as Oban to the west, Fort William, Ben Nevis and the northern highlands to the north. 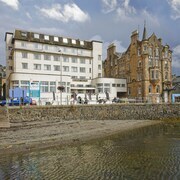 Good hotel, convenient for the location since it is in the center of Oban, but need global refurbishment. 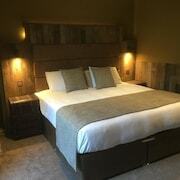 Fabulous place to stay x fab host, comfy bed,brilliant breakfast. You must try the home made banana bread ❤ spotless and would not hesitate to return. Michelle and David. Falkirk. Of all the towns in the region of Argyll and Bute, Oban is probably the most famous, being well known for its 18th century Oban Distillery, McCaig’s Tower, a Colosseum style monument that crowns the town, and its reputation for bringing in freshly-caught and delicious seafood. 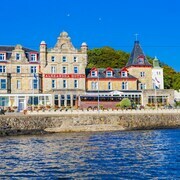 Although it might be small, it packs quite a punch, and there is a great selection of hotels in Oban to choose from too. 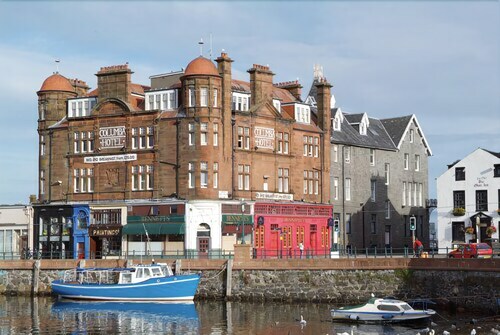 If you plan to book a hotel in Oban, then paying a visit to the Oban Distillery is a must. In fact, not getting up there to sample some of the Oban scotch (probably some of the best in the world) would be something of a crime. Although it's only small, only having two pot stills, its whiskey is well known. It's described as having that 'West Highland' flavour, somewhere between the more dry and smoky flavour of the Scottish Islands, and the sweeter undertones of the Highlands malts. So any trip to Oban is likely to leave you a little tipsy. Luckily, Oban is relatively small, so it's be easy walk back to your Oban hotel. But it's not just the whiskey that'll see you relax during your stay in Oban. 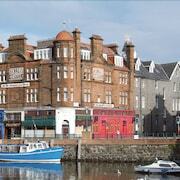 Oban is a seaside resort town that is popular with visitors from all around. Not only does it provide glorious views out into the Atlantic, but it's nestled in amongst some of the lushest green hills you're likely to see. The whole area just exudes life, so it's no surprise that people retreat here for a little rejuvenation. Oban has been a favourite holiday spot since the 1800's, so it has a lot of experience in hosting guests. 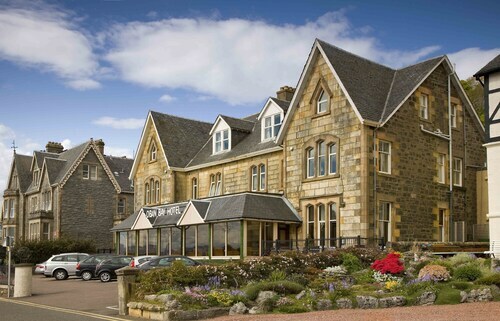 As such, the hotels in Oban are plentiful and impressive. 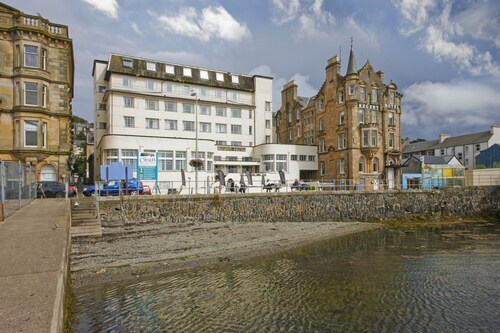 You'll no doubt find the perfect Oban hotel using the Expedia search tool. If you're looking to chill on the beach, head to Ganavan Sands; a beautiful sandy beach offering incredible views. Be sure to take the great little coastal walk, if you're looking to get active. There are also a whole host of water sports on offer in Oban too. Here, visitors can go scuba diving or sailing. 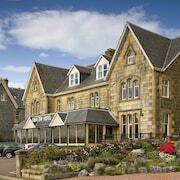 All this is close at hand when you stay in one of the top hotels in Oban. Oban is a fantastic jumping-off point for visits to the Hebrides and the Argyll & Bute region. 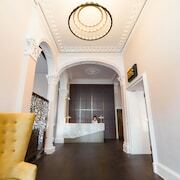 So if you are looking to go further afield, you can easily research your visit and book your stay at a Oban hotel using Expedia's convenient search tool. Argyll and Bute, one of the country’s most historically and culturally important regions. Home to significant events such as the crowning of ancient kings and the arrival of Christianity, this is a fascinating part of the country to explore. 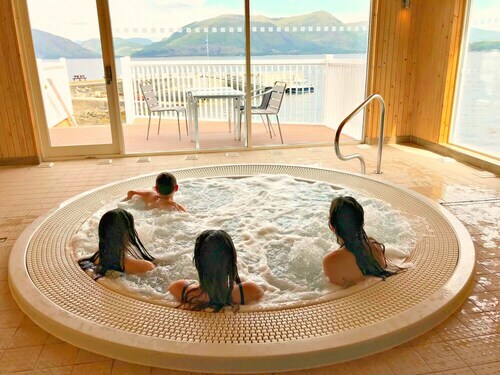 Anyone booking a hotel in Oban to explore the region will discover that there is no part of Argyll & Bute that isn’t either remarkably scenic, from its forests and mountains, to its islands and waters. Those looking to visit local cultural sites will enjoy an array offerings, such as Iona Abbey on the Isle of Iona, Skipness Castle near Campbeltown, or Skerryvore Lighthouse off the shores of the Isle of Tiree. Explore Oban with Expedia's Travel Guides to find the best flights, cars, holiday packages and more!